This error happens when trying to log in or when you try to do things in the Admin Area. Basically you keep getting logged out for no apparent reason. What does this mean? It means that when you upgrade from an older version of WordPress, the number of Unique Keys and Salts may not be the same. And so, if the latest version of WordPress is expecting eight secret-key constants, but your site's wp-config.php only contains four constants, you're gonna get the "WordPress Encrypts User Cookies" error. To resolve the "encrypts cookie" error, you need to update your site's Unique Keys and Salts (secret keys), so as to provide the correct number of key constants. So if your old WP site only has three key constants, and you upgrade to WordPress 5.0, you will need to add the five missing constants (for a total of eight), so that WordPress can operate normally and without error. If you are upgrading from any version of WP to the latest version, you can fix the error by simply replacing your existing secret keys with a brand new set. To do so, visit the WordPress Keys & Salts Generator, copy the results, and replace your existing keys with the freshly generated code. Then save changes, upload to your server and done. Once the new, complete set of keys is added, the encrypted-cookie error will disappear. As explained previously, your site's wp-config.php file should have the same number of constants that is expected by WordPress. Although ideally everyone everywhere always would update to the latest version of WordPress, we know that's just not a realistic expectation. So for any other "non-latest" upgrade path that you may be taking, just make sure that your new version of WordPress has the correct number of secret keys defined. 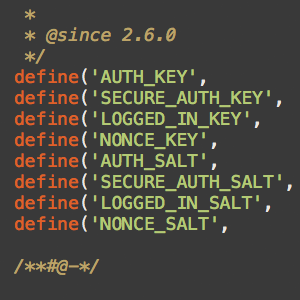 Check out the previous section for a list of WP versions and their respective number of Unique/Key salts.